It's that wonderful time of year again where I get to look back on my photos from this last year and decide which 10 shots were my favorite. It was a difficult year for choosing the best as I got out a ton this year and added many new photos to the archive. Thank you everyone for your continued support, likes, loves, shares, upvotes, and print purchases. You all make it possible for me to continue doing what I love to do. 1. Last winter, I shot a bunch of new snowy Downtown Truckee scenes that were very popular on social media. This image ended up being popular with traditional media too and was licensed for use in the Wall Street Journal. The article is HERE. 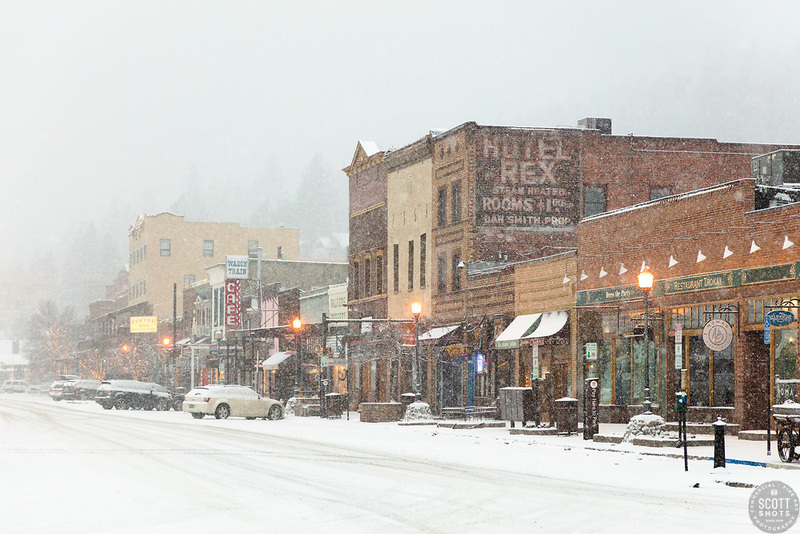 "Downtown Truckee 41" - Photograph of historic Downtown Truckee, California shot during a snow storm. 2. I've shot this awesome wavy shoreline on Lake Tahoe's east shore before. I had an idea for shooting it at night and I finally executed it! I love how the lights from the cars highlight the wavy shoreline even more. 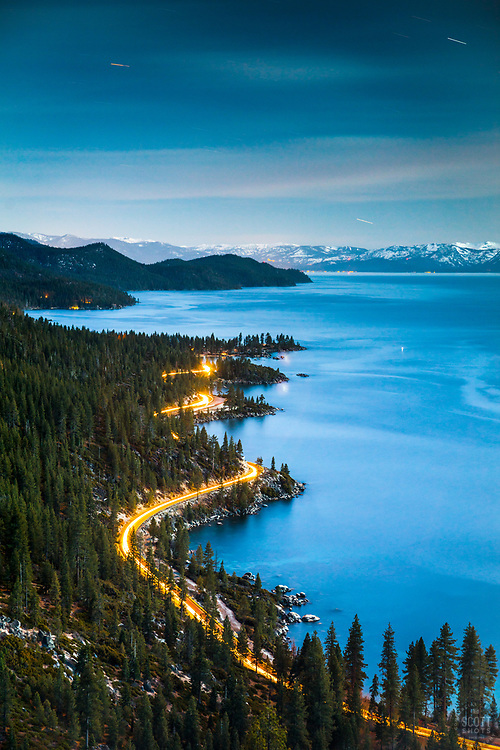 "Tahoe East Shore At Night 1" - Photograph of the wavy shoreline along Lake Tahoe's east shore, shot at night while cars were driving along the road. 3. 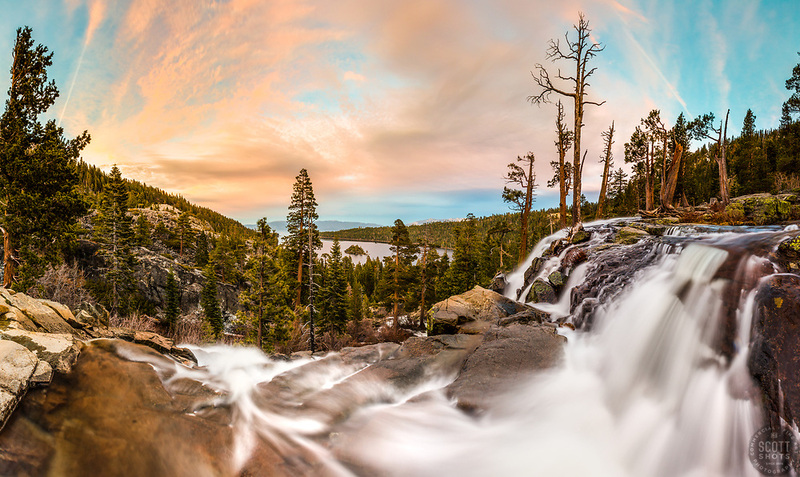 It's hard to go wrong at Eagle Falls above Emerald Bay, Lake Tahoe, especially when you get a nice sunset in the background with the falls flowing strong in spring. "Eagle Falls At Emerald Bay 7" - Stitched panoramic photograph of Eagle Falls above Emerald Bay, Lake Tahoe flowing strong. Shot at sunset. 4. I had a lot of fun this year "light painting". 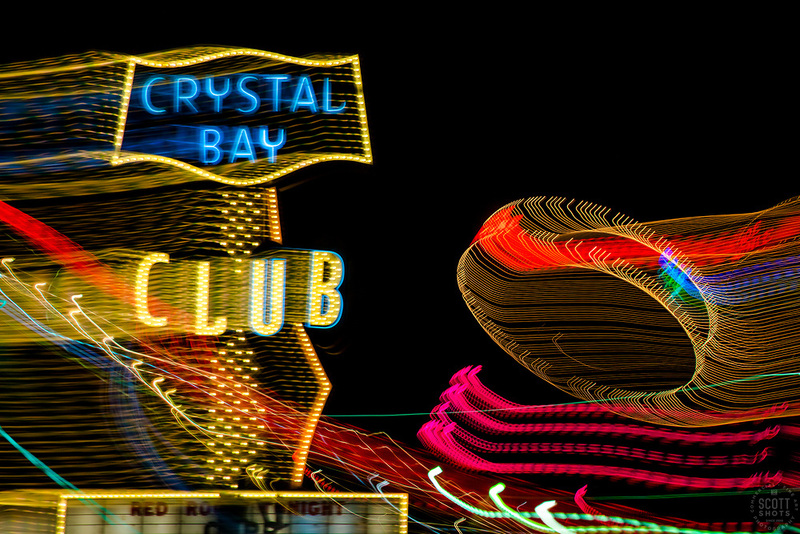 The lights from the Casinos on Tahoe's north shore and south shore made for some really fun subject matter. This was my favorite of the bunch, the Crystal Bay Club on the north shore. "Tahoe Lights 7" - Photograph taken at the Lake Tahoe northern state line casinos. The look was achieved by shooting a handheld long exposure and zooming the lens during the exposure. 5. I was lucky to get out backpacking a few times this summer. My favorite place to backpack to and camp at is Paradise Lake. You can probably see why it's my favorite spot in the photo below. This shot made it onto the cover of Tahoe Weekly magazine. 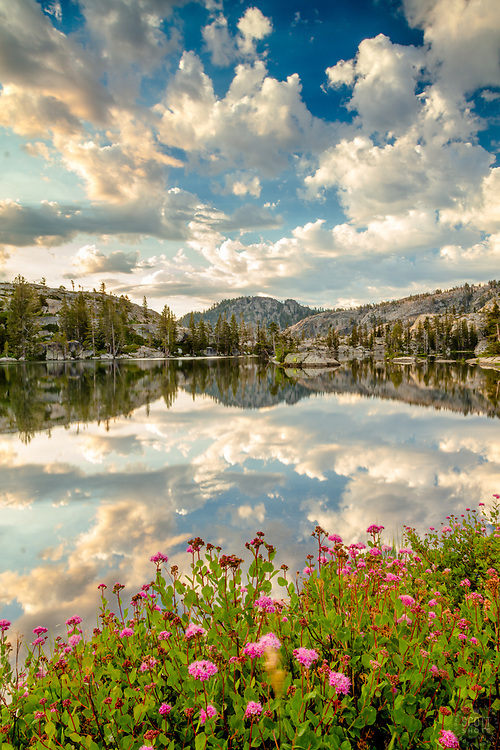 "Wildflowers at Paradise Lake 3" - Photograph of wildflowers and puffy clouds in the early morning at Paradise Lake. 6. One of the best sunsets I have ever seen! My photographer friend Tony Spiker shot it with me and we were saying that nobody would believe our photos because the sunset was so itense. The little bit of wildfire smoke in the air mixed with perfect sunset clouds and created this incredible scene. 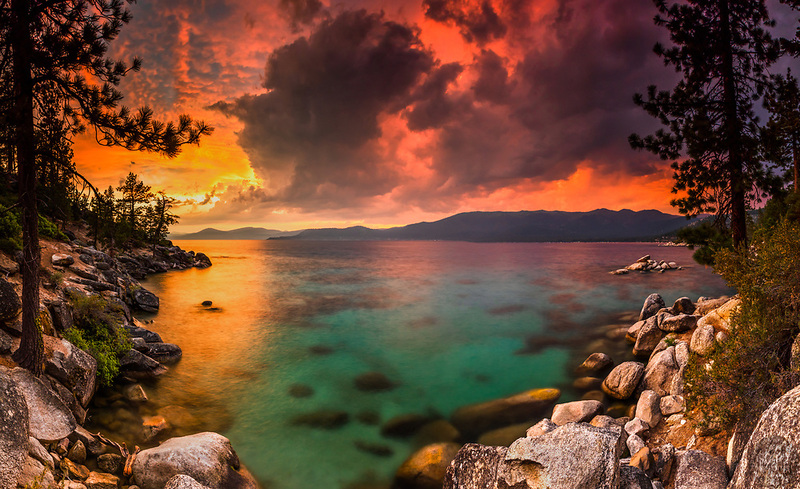 "Sunset at Lake Tahoe 43" - Stitched panoramic photograph of a vibrant smokey sunset at Lake Tahoe, just north of Sand Harbor. 7. My underwater housing for my camera was used a bunch this year. 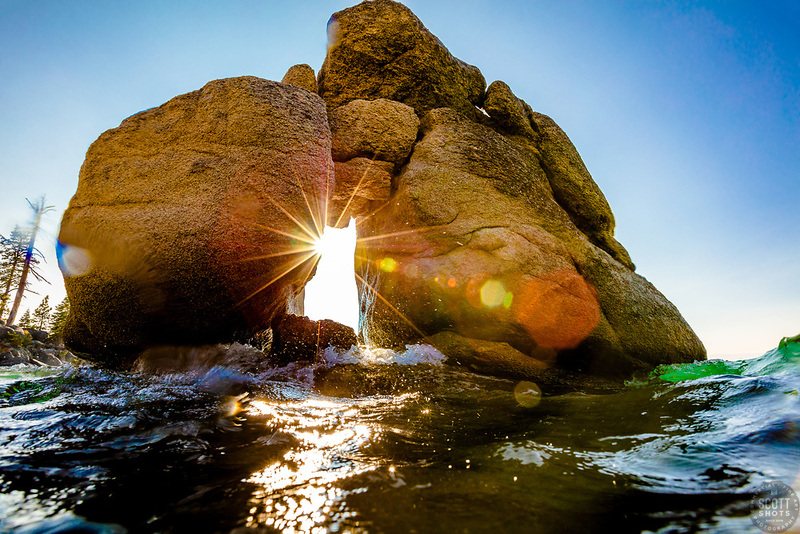 I shot this arch at Whale Beach, Lake Tahoe while swimming around with the camera. So much fun! "Boulders at Lake Tahoe 54" - Photography of a keyhole like boulder formation at Whale Beach, Lake Tahoe. Shot shortly before sunset while swimming with an underwater housing for the camera. 8. Again, I got out with my photographer friend Tony Spiker and we had some fun at an aspen grove above Lake Tahoe. We used headlamps to light up the aspen, and the Milky Way can be seen above the lake. This one will look incredible as a large print. 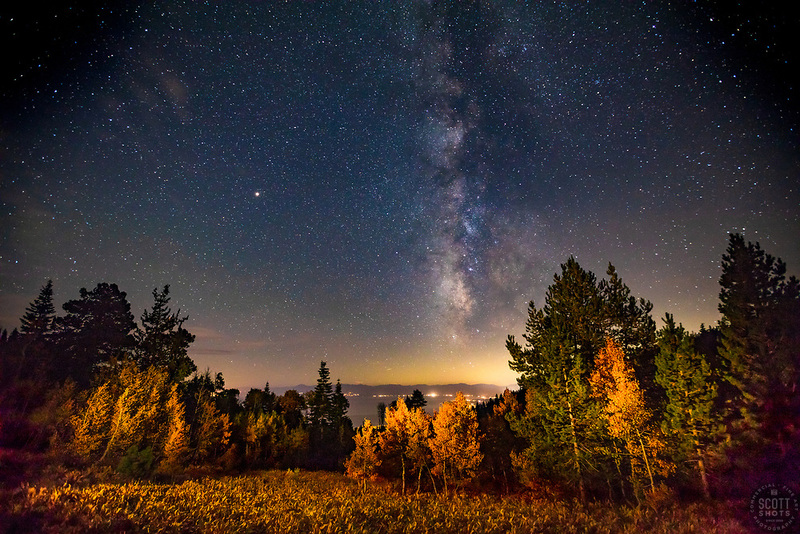 "Milky Way Over Lake Tahoe 5" - Night time photograph of stars and the Milky Way above an aspen grove and Lake Tahoe. 9. Over/Under shots! Like I said, that underwater housing was used a bunch this year and I had some fun getting shots of Kokanee Salmon spawning with yellow fall colors in the background. An incredible experience. 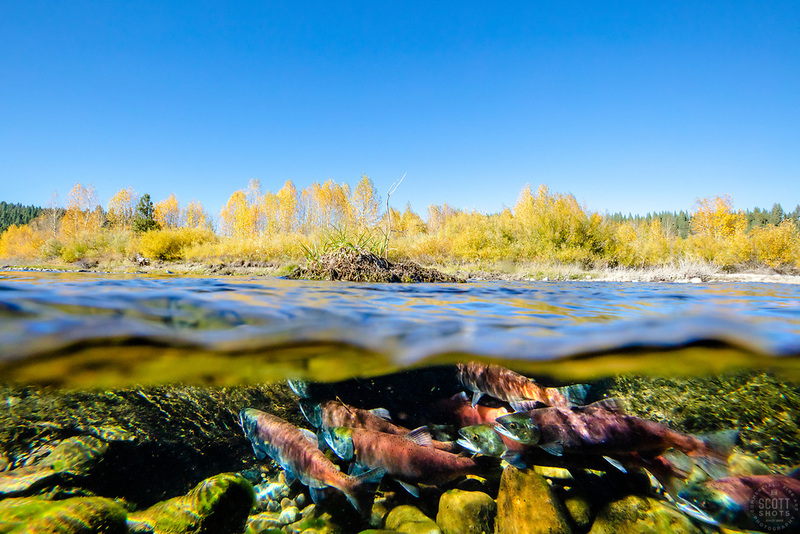 "Kokanee in the Little Truckee River 3" - Over/under photograph of Kokanee Salmon spawning in the Little Truckee River near Stampede Reservoir. "Secret Cove in Autumn 5" - Photograph of fall foliage along the shore at Secret Cove, Lake Tahoe. If you'd like to follow along throughout the year, please follow me on these social medias: Facebook, Instagram, Steemit, Dtube. Happy Holidays! Happy New Year! Cheers! And thank you for looking and reading! A few days ago, I got out to one of my favorite "go-to" spots for sunrise photography. It's a fairly easy spot to get to when I don't have a lot of time to spend hiking or driving further. 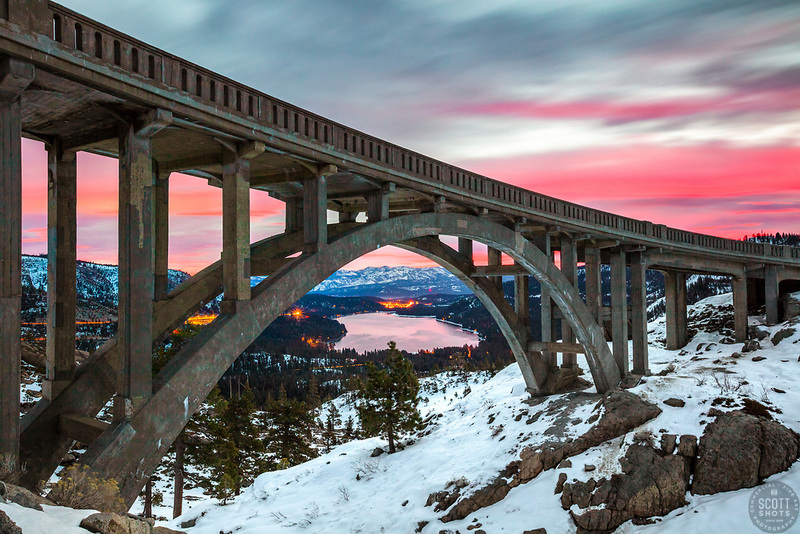 Rainbow Bridge above Donner Lake and Truckee, California has provided many cool photos for me over the years. Although I was hoping for more explosive sunrise colors that were also higher in the sky, I really can't complain as the vibrant pinks were beautiful looking. "Sunrise at Rainbow Bridge 4"
Photographed with a Canon 5DS R and a 16-35mm lens set at 28mm. A graduated neutral density filter was used on the lens in order to darken the sky above the bridge a bit. The ISO was 400, the aperture was f11, and it was a 30 second exposure. The scene actually looked darker to the naked eye but the long exposure helped lighten the scene and also bring out more color to the lights of Truckee and Hwy 80 in the background. The RAW image was worked on in Photoshop's Camera RAW feature where I lightened the shadow areas quite a bit. As always, fine art prints of this image are available through my website. Canvas prints, prints on metal, and photo gift items. Thank you for looking, reading, and watching! Metal Prints Are Now Available! Just in time for thee Holiday gift giving season, prints on metal are now available to order through my Scott Shots Photography website www.ScottShotsPhoto.com. Unlike canvas prints that are printed by me personally, metal prints are printed by a third party lab and shipped directly from the lab to you. Two types of metal prints are available. These prints are not signed or numbered on the print, however they are part of the limited edition prints. "Metal Print: Photographic" prints are the higher end, better quality print. Not to be confused with the less expensive "Metal Prints" that print directly to aluminum, this is a real chromagenic latent image print behind a carefully sourced rare ultra-glossy UV lam and mounted on thicker, stiffer aluminum sheets. The level of detail in this print is so superior to infused / dye sublimation, you’ll never look back. This print offers all the amazing attributes of acrylic prints – sharpness, contrast, details, etc – but it’s lighter, less expensive, and the thinner profile is easily framed or looks great on its own. Standard sizes are available through the shopping cart, custom sizes are available, please contact me for a price quote. "Metal Prints" - are the less expensive option and are infused directly onto a solid sheet of aluminum. Your choice of finish will add incredible color saturation and contrast to your metal print. The glossy finish gives your print a glass-like sheen, while the matte finish reduces glare. Each metal print comes ready-to-hang. Standard sizes are available through the shopping cart, custom sizes are not available. Print prices can be found by clicking on an image in the website, then clicking "add to cart". 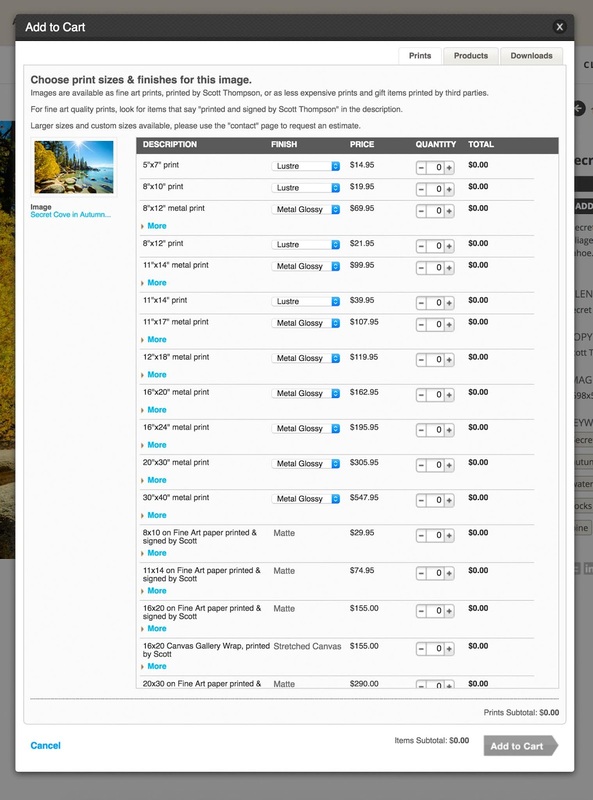 Here is a a screenshot of part of the price list. So if you are looking for the perfect Lake Tahoe themed gift this holiday season, please consider buying a print from my website. 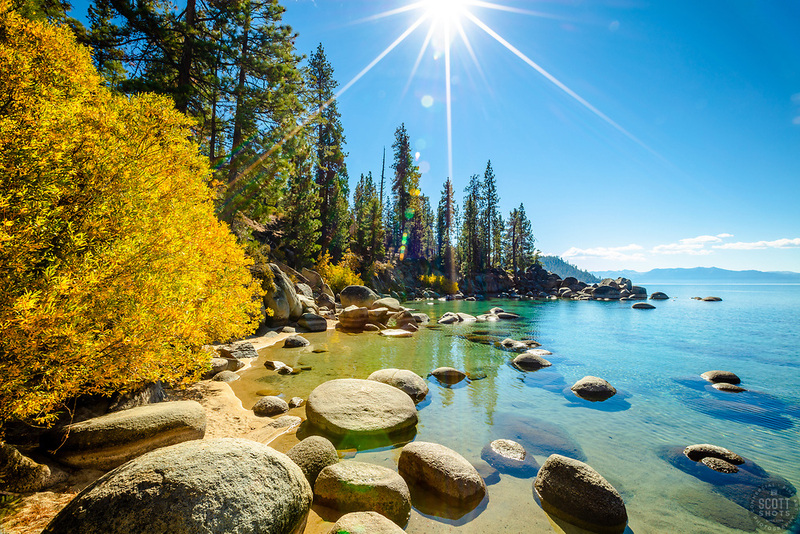 As a bonus, I am offering a 15% discount on Lake Tahoe prints! Offer available through "Small Business Saturday" 11-24-2018. Use coupon code: PRINT at www.ScottShotsPhoto.com or mention this ad at the @Vista Gallery in Kings Beach. Lake Tahoe TV Interview - I Was On TV!